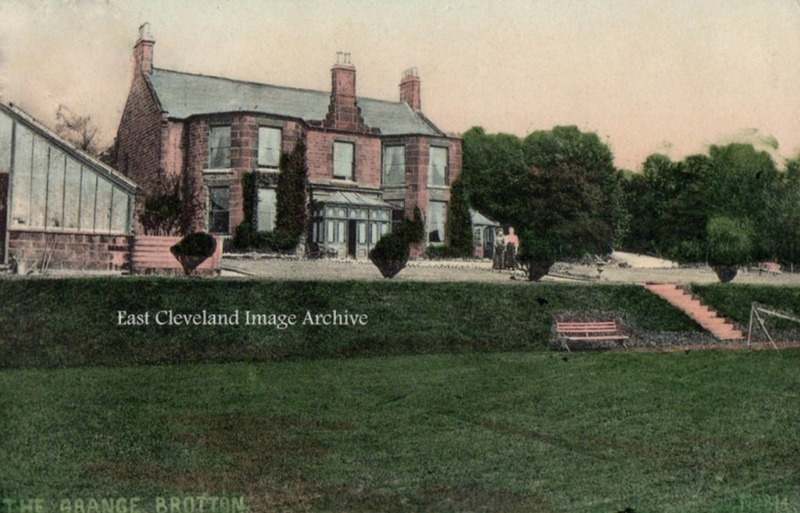 The Grange, Brotton standing on Coach Road was originally the home of Robert Morrison. He started the ironstone mine (Morrison’s Pit) close to his home, from 1881 the house was occupied by Joseph Taylor. Listed in the Census of 1901 as Accountant and Secretary of Brotton Gaslight and Coke Company. The two figures in the postcard image could be Margaret Taylor (wife) or Margaret (daughter) or possibly Beatrice Rush (maid). Roger Hardcastle tells the Archive: ” My great grandfather was a doctor; Thomas Taylor. He had five children and one of them was George, born in 1885 who was my grandfather. It was our branch of the Taylor family that lived in the Grange at Brotton. Going through old photo albums there is a photograph of the Grange”. Charles Taylor advises: “George Taylor was (I believe) the brother of Tom Hugh Taylor who was my grandfather and I have a couple of pictures of gatherings in the Grange garden in which the whole family is shown. Roger Hardcastle is related; as we share the same great grandfather and our grandfathers were siblings”. Image courtesy of John G Hannah and thanks to Roger Hardcastle and Charles Taylor for the updates.